2019 Summer Dates Now Live!! Recently I was working on a XenApp project where I noticed an issue with the server builds when trying to deliver App-V packages. The issue was that 8dot3 naming (a requirement for App-V package delivery) had been disabled. 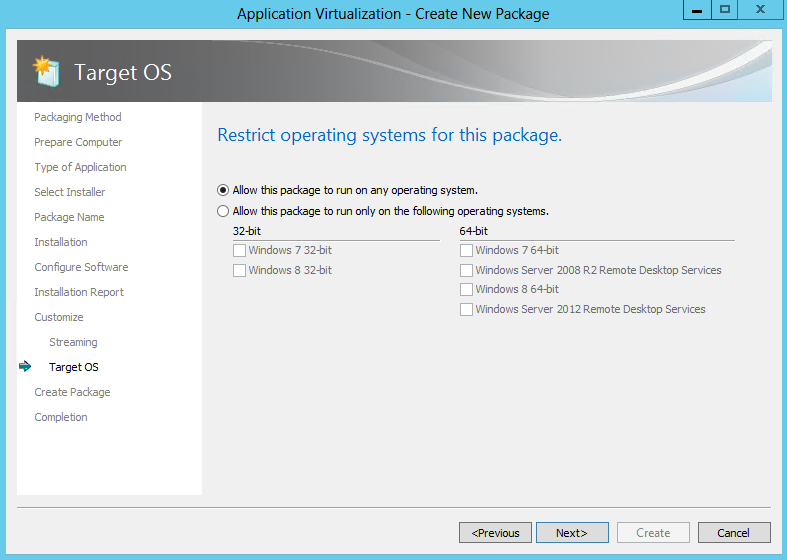 This setting is easily changed with a simple fsutil command or change to registry. There is a DSC Resource Kit if you need more resources beyond this. However as I am only interested in registry we can get going without anything else! As you can see from the above the configuration simply leverages stored properties and associates them to a desired state. Key, ValueType , ValueName and ValueData – Are all self explanatory and allow us to enforce as above. There are also other properties you can use with the registry resource, check out a full list here. As mentioned earlier, notice how the configuration reads more like a set of rules to action rather than a traditional script which explicitly executes specific actions. When you have your .MOF ready you now have two options to deploy the configurations; push or pull. Push deployments are the most simple approach in that it requires no server setup, however it is a manual operation. Pull works by setting up a single server to hold configurations and configuring other servers to periodically apply (pull) them, this does require setting up a server, certificates etc. however the benefit of this approach is that it automated after that. For the purpose of simplicity in this case I will just use the push approach, however you can read more about pull servers here. Start-DscConfiguration -Wait -verbose -Path "Path to folder containing .MOF configuration files"
The great thing with this approach it that you can run this periodically to ensure overtime your various servers stay in accordance with your server standards. 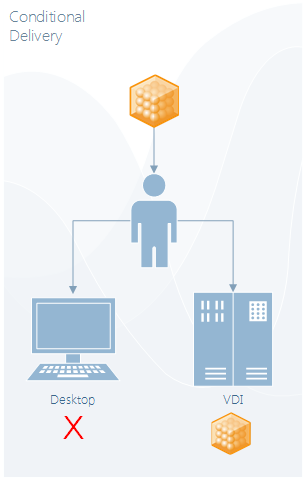 With a pull server, configuration ‘drift’ can be further addressed in automated fashion. So there you have it, a quick run down on how you can use Power Desired State Configuration to enforce and regulate registry values on server estate! The simple PowerShell script below will query its own package and version GUID and populate RunVirtual keys for any processes listed in the ApplicationExes variable (pre-populated with Office exes). The script can be called with either a -Publish to populate the keys or a -Unpublish to clean up the keys. The script itself is of course sequenced into the package under the scripts folder. The great thing about the approach above is it doesn’t matter if you ever happen to update the connector package, the script will always lay down the correct GUIDs, so what you end up with is a self contained ‘worker package’ that just sits inside your connection groups ready to do any necessary RunVirtual work on behalf of its other members. Feel free to use the script above and tailor it to your needs. For further reading check out this post here where I further discuss real world RunVirtual. 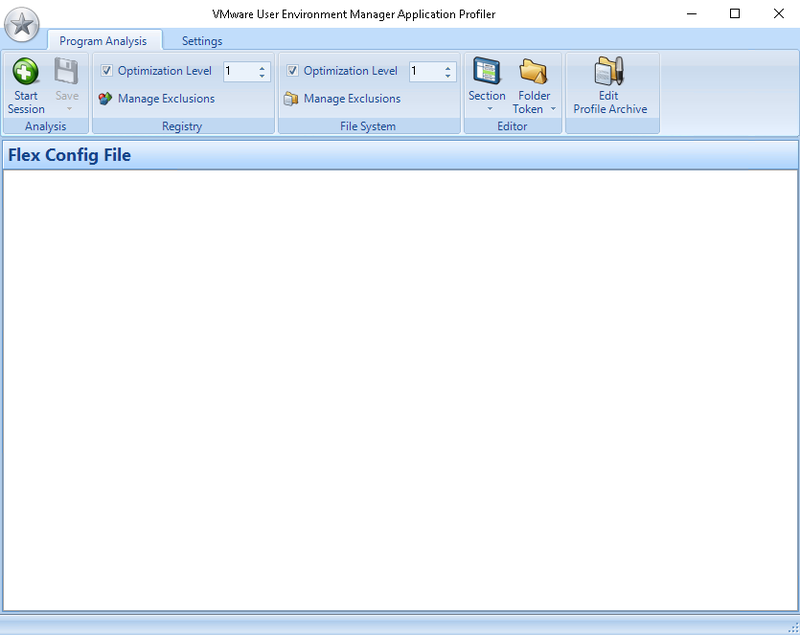 Over my design and implementation projects with VMware User Environment Manager (UEM) I couldn’t help but pay particular interest into how it works with App-V. In this blog I intend to lift the hood on how UEM captures and collects user settings for App-V and the mechanisms it uses to make this as seamless as possible. As far as application profiling is concerned, I always recommend a local installation of an application where possible, this is to limit any potential conflicts or incorrect paths being detected. The goal should always be to capture the traditional locations an application writes to and then let any path translation for other technologies such as App-V or ThinApp happen later down the line. Taking this approach will give your configuration the best chance of survival in the wild and will also reduce the overhead of complexity when generating the configuration. That being said I have tested detection of settings of an App-V package with UEM and found that it has located the traditional paths correctly. Another useful approach I have taken when bringing profiling tasks into operational processes is to include the profiler tools as part of the packaging build. By doing this you can include the generation of an application profile into the process of actually packaging it. For example a packager could sequence a package, profile it, collect both App-V and UEM assets and then copy them off into a single payload. Once you have created your application profile and imported it into the management console as described in my previous blog post here you can go ahead and tick the box that says Enable App-V 5.0 support. While the GUI mentions 5.0 rest assured the feature works with 5.1 too! Firstly, DirectFlex must be enabled. This allows the UEM engine to intercept process launches on the client to import settings rather than doing the work upfront at logon, the importance of this mechanism will become clearer further in this post. 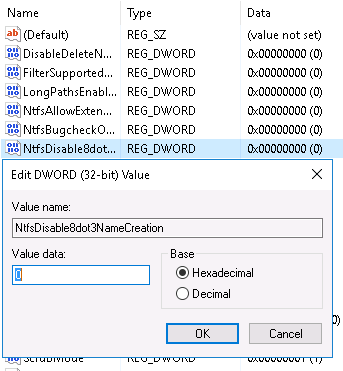 Secondly, at least one of the DirectFlex executables must be configured without a path. This is because once we introduce App-V we can no longer rely on a certain path to an executable in traditional dependable paths (Program Files), we need to give the UEM engine the freedom to detect a process launch irrespective of where it is being launched from. 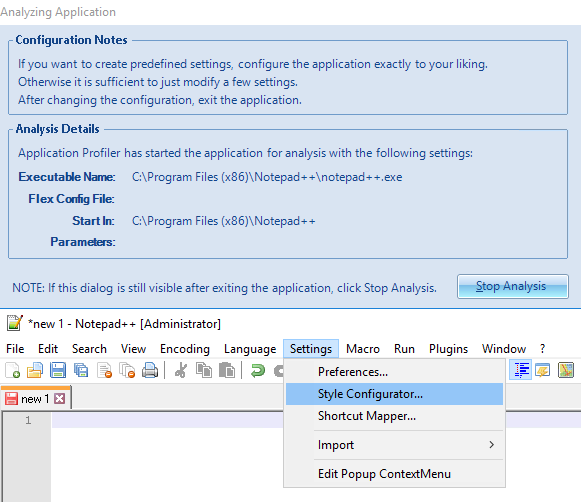 Once you have specified your executable(s) for your application configuration, that’s it, you are all set! The detection that the process is being launched from the App-V cache will launch the UEM (Flex) engine for the App-V import and it will leverage the /appvve switch to elevate the flex process (FlexEngine.exe) into the virtual environment. This ensures that the import happens within the ‘bubble’ of the package. By taking this approach UEM essentially writes the change within the App-V environment and hands off to App-V to redirect the changes where it sees fit. So to further understand why UEM takes the approach described above we need to dive a bit deeper and look at how mini filter drivers work to intercept operations in the I/O stack. Mini filter drivers attach in a particular order referred to as altitude, these are managed by Microsoft and allow one filter driver to intercept calls before another. For each I/O operation the filter driver has the ability to issue a pre-operation callback routine and/or post-operation callback routine. 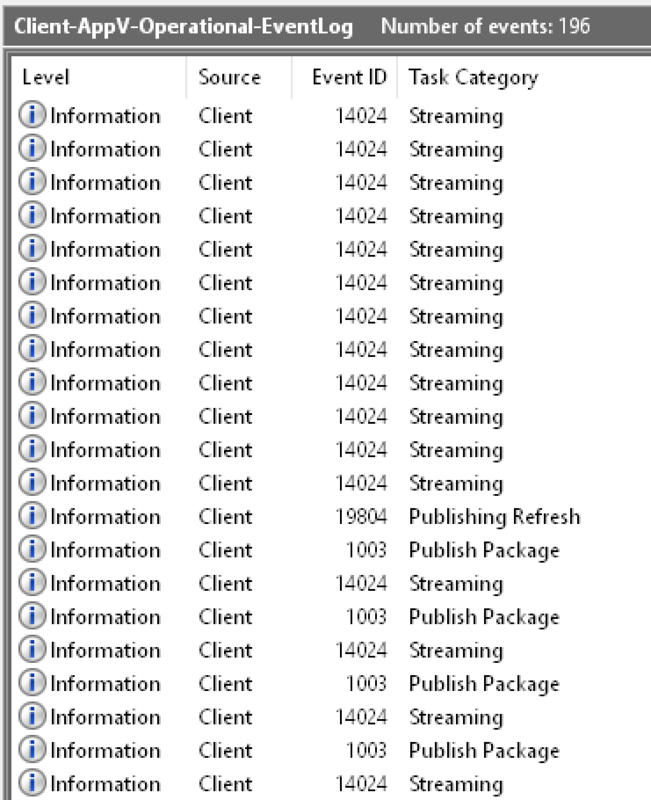 Above is a list of some of the filter drivers on a UEM client machine in my lab. As you can see the UEM immflex mini filter driver sits at a lower altitude than the AppvVfs driver which is responsible for the App-V virtual filesystem. This isn’t ideal because it means that UEM can only deal with the I/O stack after App-V has diverted changes around. Compare this to the UevAgentDriver which has the luxury of sitting above the App-V driver, this means UE-V (Microsoft’s User Personalisation solution) does not care so much about whether an application is App-V or not as it gets to work before any diversions take place. For this reason as we saw in the logs above, UEM has to detect App-V packages and inject itself into the App-V virtual environment to get itself into the correct altitude using the /APPVE switch on its engine process. 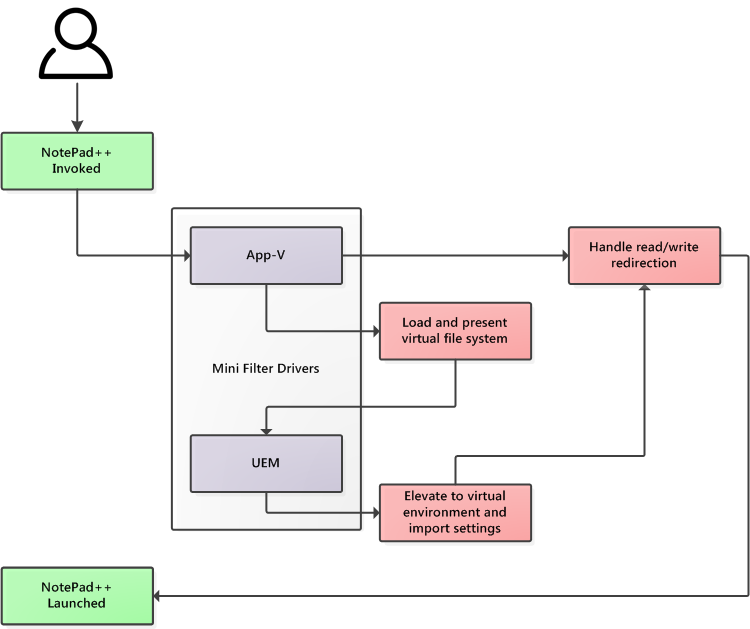 Above I have detailed a somewhat simplified representation of what happens when a user launches an App-V application which we have enabled for personalization in UEM. All of this happens transparently to the user who at worst sees a small delay between invocation and launch, however usually this is not noticeable. In an ideal world UEM would secure a filter driver altitude higher than the App-V VFS so that it wouldn’t need to rely on detection of App-V vs. traditional applications and inject into the virtual environment. However all said and done, UEM is very effective in roaming settings for App-V packages in its own unique way! 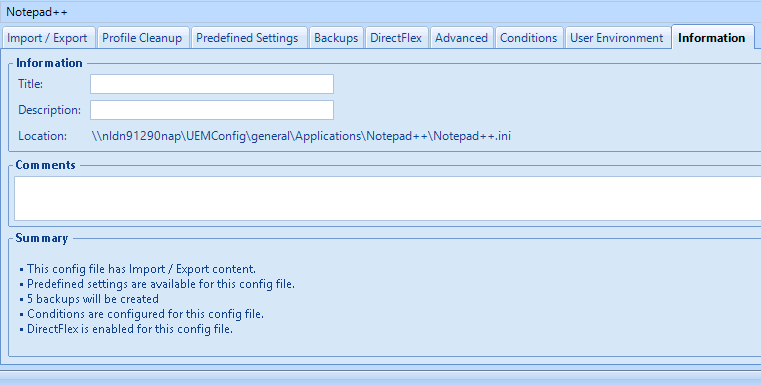 I have recently been working a lot with VMware User Environment Manager (UEM), formally known as Immidio Flex+. If Ivanti’s Desktop Now powered by AppSense is too complex and Microsoft’s UE-V is too simple then UEM surely sits squarely in-between the two! It has a very light weight infrastructure and still maintains a good level of control when addressing user experience across Windows applications whether they are App-V delivered or otherwise. In this post I want to walk you through the high level process of capturing and deploying application settings which you want to roam for your users. The .ico is used to populate the console with an icon once you import the config, The .ini file contains all the settings locations you have captured and any deployment configuration you specify later and lastly you will find a .flag file which is used for VMware UEM registration. 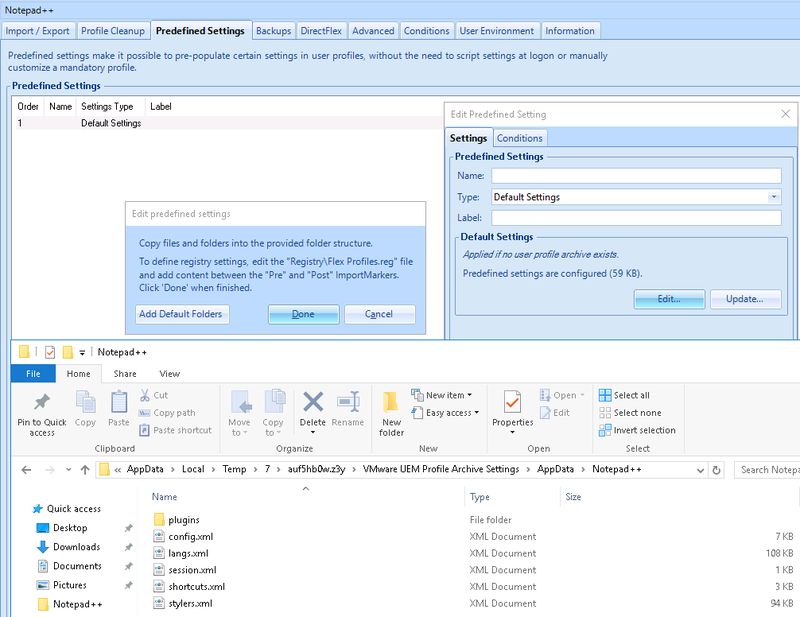 Optionally if when you save your configuration you can include the actual settings on the machine referred to as Predefined Settings these will be saved as a .zip file and allow you to dictate the initial settings a user will get for a given application rather than just locations to roam. This can be especially useful if you want to use UEM to configure an application to a golden state from day one for a user. 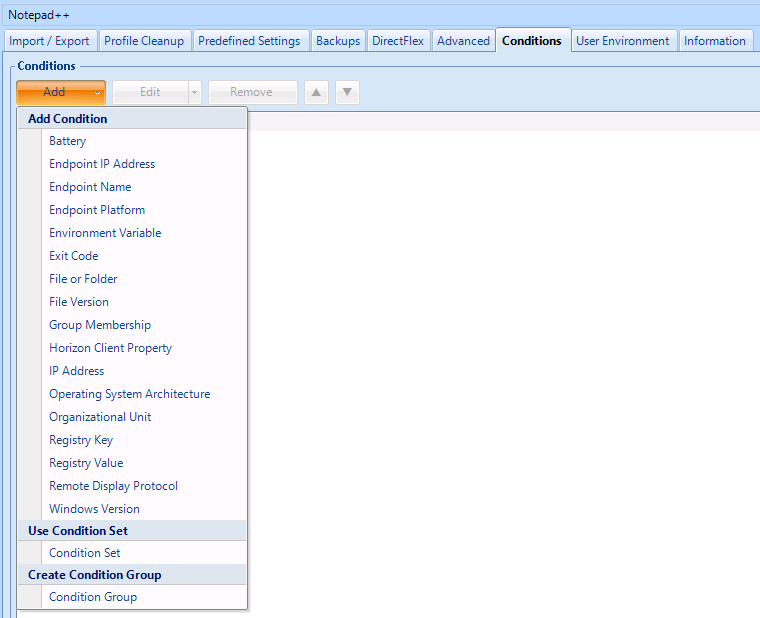 Step Three – Configure your Configuration! Here you will be a representation of the actual configuration .ini file you have just imported. 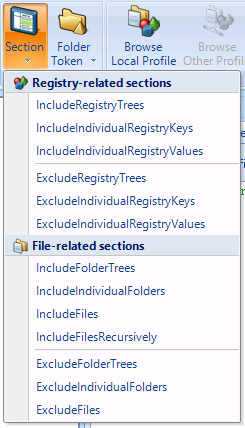 You are able to edit the file directly in this window if you so wish, you can also take advantage of similar functions you would find on the UEM Profiler such as the ability to add in Section and Folder Token tags to further build your configuration locations. 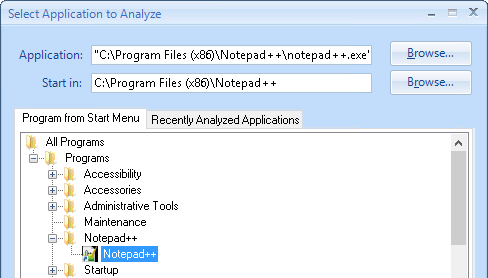 On this tab we can configure any local file or registry assets which we want to delete upon logoff or process exit. This can be especially useful when trying to move off roaming profiles as you can slowly trim down the local profile each time you chose to roam a new collection of settings. Overtime, this approach will mean the roaming profile gets slimmer and slimmer until eventually it can be retired completely in favour of UEM. As mentioned in step one, this is the place where you can work with any predefined settings. These are basically a collection of files and/or registry that will be delivered from the offset for your users without any requirement to include them as part of a mandatory profile or logon script. UEM allows you to work with these settings directly from the console as shown above. On this tab you can chose to keep point in time backups of user personalisation for each given configuration, this can also be specified across all configurations as a global setting using the GPO if desired. The default is not to create backups, if you turn the feature on then all you need to specify is however many previous captures of user settings you wish to keep. 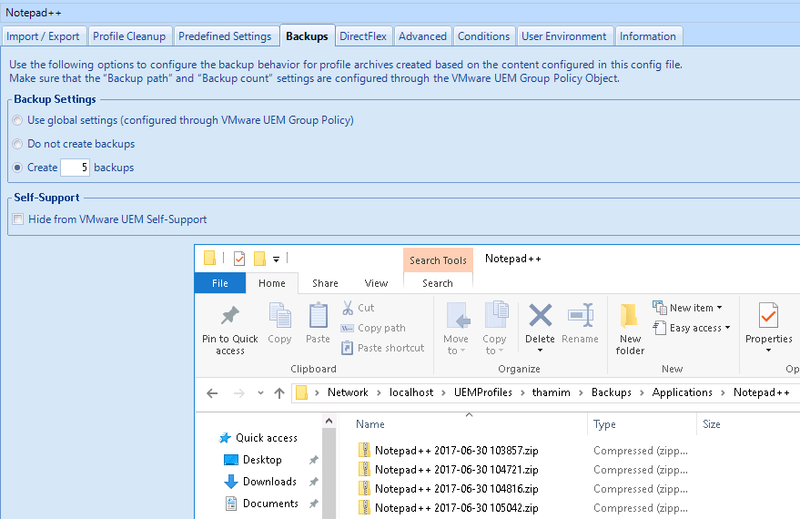 These will be stored in the UEM profile share under a separate folder called Backups. By default enabling this feature will mean users can self service restore their application personalisations to a point in time back up on the client side using the UEM Self-Support. 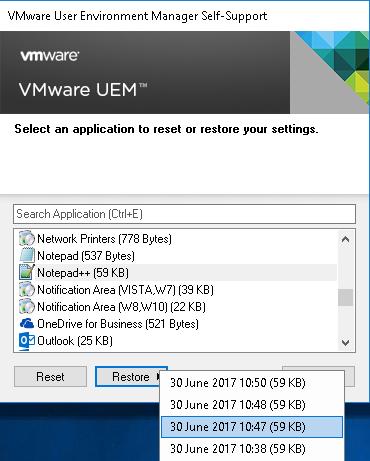 You can disable this ability by checking the Hide from VMware UEM Self-Support tick box shown above. This tab is a very useful place to refine how and when settings are imported. Without DirectFlex everything happens at logon (just in case) which could be wasted overhead if the user never launches the application. With this setting enabled the personalisations are only imported at process launch (just in time), UEM will intercept the executable launch to pull down any stored settings. The subsequent export of settings can also be configured to happen at either (last) process exit or logoff. Additionally we also have the opportunity to Enable App-V 5.0 support, this will allow UEM to listen out for a given executable (this must be supplied without a specific path), when that process is seen launching UEM will essentially use the /APPVVE switch on the Flex engine process to inject into the virtual environment and import / export settings accordingly. Similarly ThinApp support can also be activated using the checkbox provided and unlike App-V support it doesn’t require a pathless executable reference. DirectFlex supports multiple executables to be listed per configuration. Enabling DirectFlex also gives the opportunity to run other tasks at executable launch on the User Environment tab as I will go on to explain. Most of the settings on this tab are self explanatory. Config File Processing will be greyed out if using DirectFlex otherwise by default it will be ticked to specify import/export to happen at logon/logoff. Skip allows us to specify files to exclude from the export of local settings back to the share based on size and/or age. OS-specific Settings can be used to prevent user settings transferring between different operating systems, typically this isn’t something that I would suggest as it isn’t conducive to a seamless user experience across platforms however can be enabled for circumstances that are known to cause issues. Conditions form a key component of UEM when it comes to controlling who and what is effected by specific configurations. These conditions are can be formulated directly on the configuration using the detections listed above. You can also use re-useable predefined conditions called Conditon Sets which are configured on the Conditions tab of the console. The various conditions can be formulated using logical connectors such as AND/OR to tightly control the exact circumstances you want the configuration to be applied. This tab is often overlooked as it is hidden away somewhat from the rest of the environment related actions in the console however it offers a very useful ability to able to trigger tasks to occur at process launch. This is less related to the user personalisation and more regarding environmental changes you wish to make upon the user launching the application. As mentioned earlier this feature requires DirectFlex to be enabled and will be greyed out otherwise. Actions you can trigger here are almost as wide ranging as the various settings you can achieve on the main User Environment tab in the console but rather than apply at logon/logoff they will apply at process stop/start. If the out of the box environment settings do not suit your needs you can always utilise this feature to run script based actions at the given time junctions (Pre-Import, Post-Import, Pre-Export and Post-Export). Finally on this tab we are able to give the configuration a title, description and relevant comments. Also there is a useful summary of all the settings specified on the other tabs for this configuration. These settings are all captured into the original configuration .ini file that we created. Now you are all set! Your configuration is now ready to be consumed by your users at next logon! While working with a large financial organisation in London last week, someone brought my attention to how RunVirtual is giving them some interesting side effects they didn’t quite expect when running other local tasks or applications. I wasn’t too surprised by what they were seeing but thought it would be a good idea to share it with you all so we are on the same page. 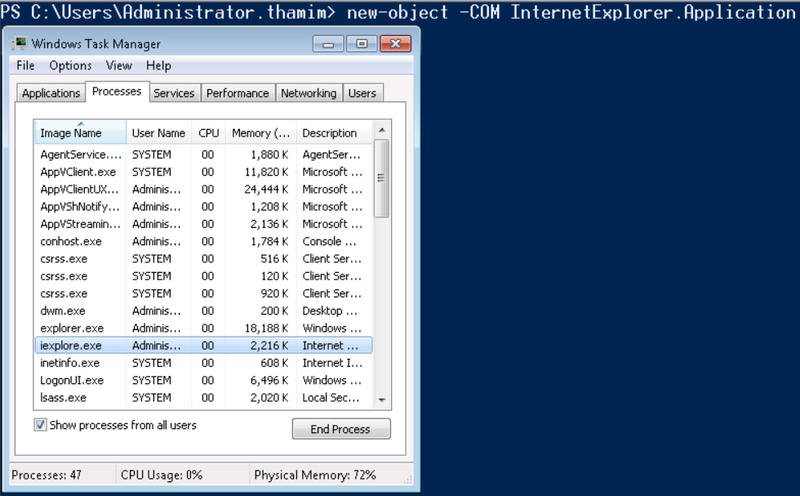 As soon as iexplore.exe is loaded RunVirtual jumps in and makes sure it is running within the virtual environment specified in the registry value. Now in this case we are interfacing via COM and anyone who has worked with App-V for a while will know COM is a key integration that we restrict by default, this isolation causes something that appears simple and local to fail due to RunVirtual being provisioned. This sets COM to be integrated with the local operating system and hence places no restriction on local processes that call other local processes that end up inside this virtual environment. 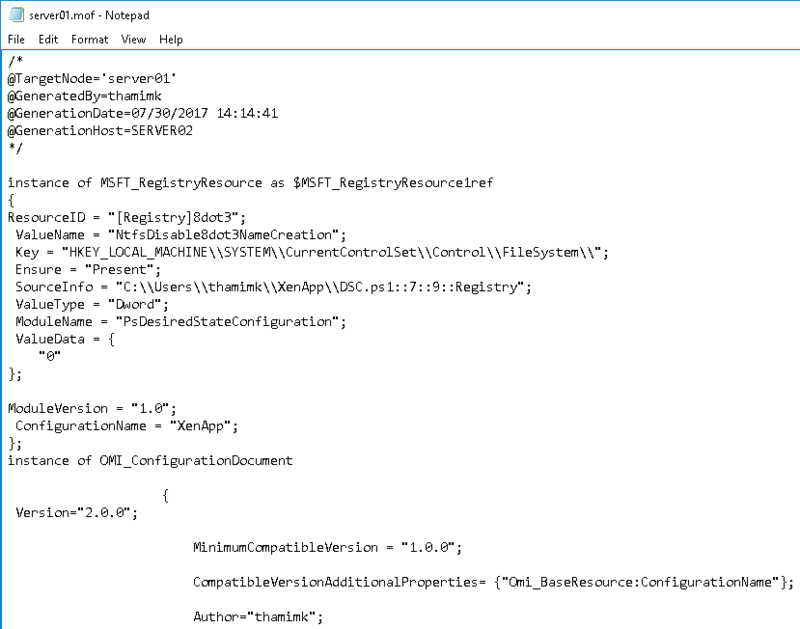 You can of course use the Deployment_Config.xml to manipulate this setting and my good friend David Falkus breaks this down on his post here. In summary be aware that when you utilise RunVirtual you have potential to affect the way other elements interface with your target local process. In terms of COM, could it be worth putting into sequencing standards that COM should be integrated for packages that will be involved in a RunVirtual key? Potentially, at least for things like Internet Explorer, it really comes down to the complexity of your environment but is definitely something to consider. They wanted a much more granular way to control whether a package gets delivered to its target destination or not. In their scenario they had a certain package which they wanted to target to users however they wanted for the package to only be delivered if the user was logging onto their VDI environment, under no circumstances did they want the package to reach a non VDI machine. Although their VDI was based on Windows 10 the same as their traditional desktop environment, they could easily identify a VDI machine by a simple registry key that was written into the image at build time. The good news was that although the sequencing process only provides an option to limit by target operating system there are other ways to condition delivery on a much more granular level including checking for the registry key VDI identifier this client wanted to check for. SCCM allows administrators to provide requirements for deployment types which will be assessed at the time of deployment to see if a package is eligible for delivery. Whether it is out of the box checks for hardware requirements or custom WMI queries, SCCM will allow specification of multiple conditions that will limit the delivery of the package. However this particular client did not have SCCM and furthermore wanted a solution that was incorporated and self contained as part of the packaging process. RollBackOnError is a much under publicised feature of App-V scripting and often over looked in terms of its power for controlling where App-V packages end up being delivered. The tag can be used very simply and to great effect in the formulation of package scripts both within the UserConfig.xml and DeploymentConfig.xml. When talking in context of conditional delivery, the tag can be used for the AddPackage and PublishPackage events. RollBackOnError allows us the prevent the associated event action occurring should there be an error, for scripts this means anything that exits with a return code of anything other than 0. We also have the optional wait parameter which tells the script to wait for a particular length of time to allow the script to complete. The example above, a check will be made for the registry key that identifies whether the machine is a VDI instance or not, if this is true then an exit code of 0 will be returned, if it is false then a failure exit code of 1 will be returned. The configuration .xml will then handle these return codes to either complete the add / publish or abort. The great thing about utilising the scripted approach is we can use whatever logic against whatever conditions we desire. 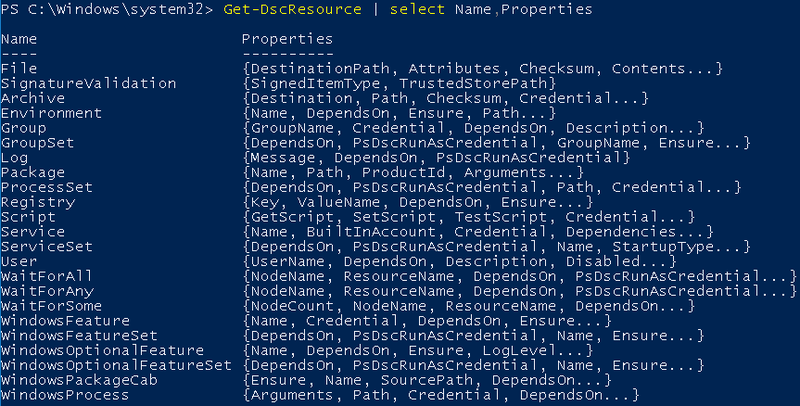 We essentially can check for whatever we want and of course it doesn’t need to be done in PowerShell either. 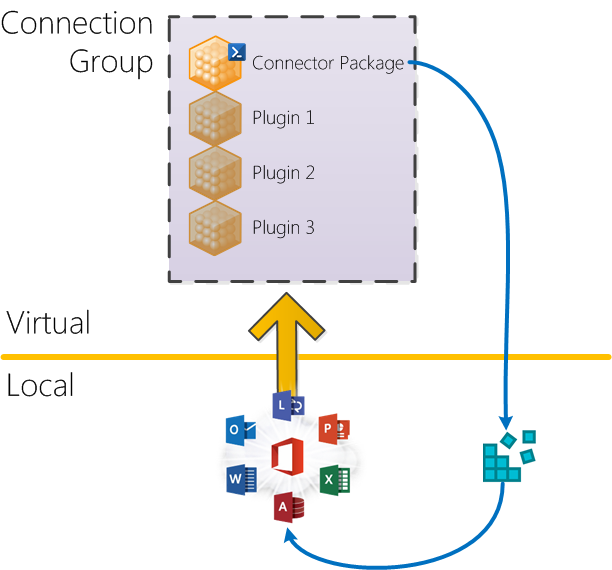 You can also further develop the approach above for conditional delivery of connection groups. This becomes useful when you want to target connections groups at a user but condition the delivery of particular groups to certain criteria. 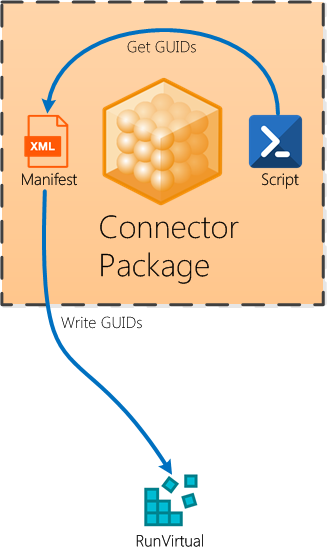 The example above utilises the IsOptional parameter in Connection Groups which can be used to specify a mandatory package member, this means if the package is not available on the target machine then the connection group will fail to deliver. 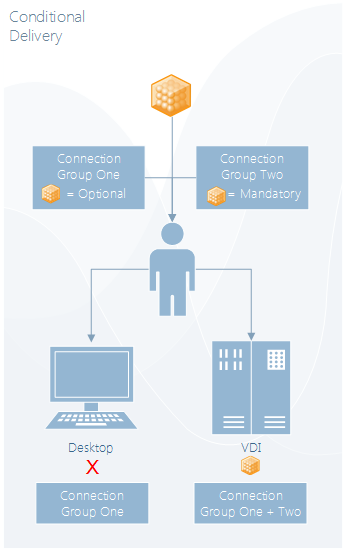 In the scenario above Connection Group Two will only deliver to machines that have the mandatory package, using the RollBackOnError logic as previously discussed in this package, we can ensure the package is only delivered to VDI machines and hence also ensure the given Connection Group also only deploys to VDI machines. It’s been a while since I last posted as I have been really busy working with clients over the last few months. I just wanted to take this opportunity to share with you a real world example of how I have recently used RunVirtual and APPVVE to enable a client to have a more flexible experience with App-V. The first step was to package and deliver Sybase 32 bit as an App-V package to the developers machines. However this on its own would mean launching PowerDesigner locally would still only ever interact with Sybase 64 bit which was also locally installed. By provisioning the RunVirtual registry key on the machine as above we were able to dictate that the App-V client listens for PowerDesigner.exe and intercepts its launch to direct it into the virtual environment of the Sybase 32 bit App-V package. This would give the local PowerDesigner application full sight of the Sybase 32 bit and enable the developers to work with it. However a side effect of this approach is that PowerDesigner would lose sight of locally installed Sybase 64 bit. 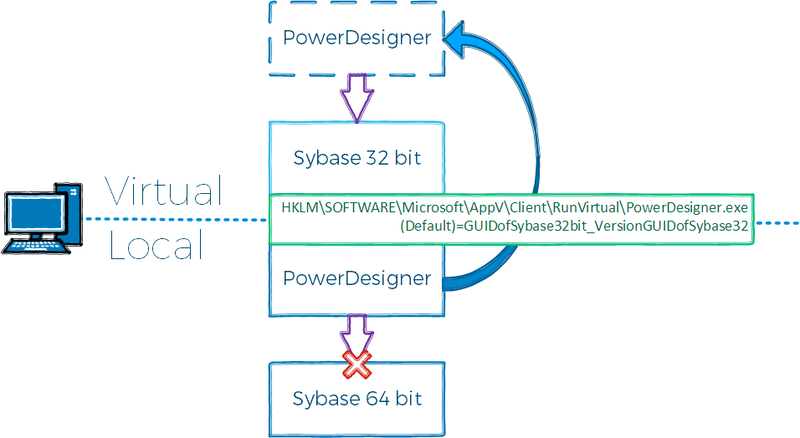 As RunVirtual operates on a process level there would be no flexibility in launch, PowerDesigner.exe would always launch in the bubble of Sybase 32 bit and developers would not be able to switch to using 64 bit which was something they wanted to do. In these initial stages we provisioned these keys manually on the machine however we also wanted a better way to manage connectors, if we stuck with RunVirtual as a solution we may have chosen to use Group Policy Preferences to write this in, or even used a script within the Sybase 32 bit package to write this down. However the requirements called not only for something manageable but a solution that would allow flexibility between using local Sybase 64 bit and virtual Sybase 32 bit so our attentions turned to APPVVE. 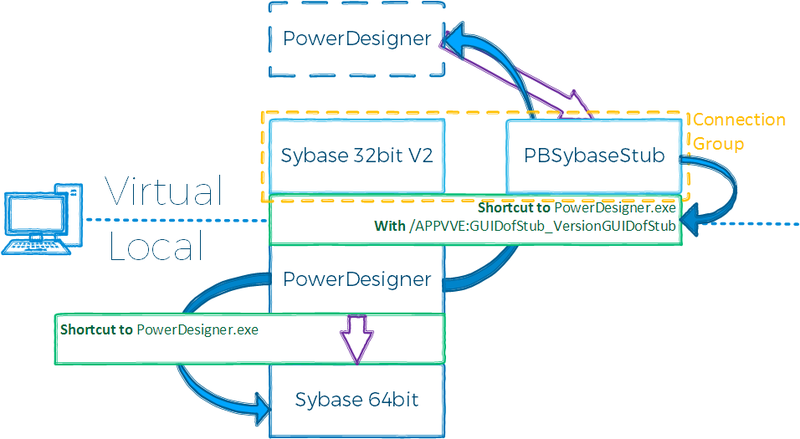 By removing the RunVirtual registry key we were able to implement APPVVE by provisioning a separate shortcut with the parameter to launch PowerDesigner.exe inside the bubble of Sybase 32 bit. 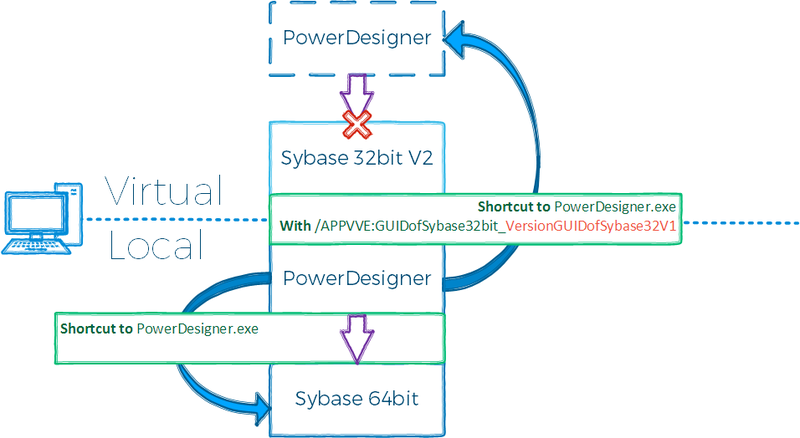 We also left the standard shortcut for PowerDesigner.exe which would of course only see the local Sybase 64 bit, this gave users the flexibility of launching with visibility of Sybase 32 or 64 bit depending on what they were developing or testing. In contrast to RunVirtual which is more a blanket interception of process which is great for ‘user unaware’ scenarios, APPVVE gave us the granularity in a ‘user educated’ scenario where they would intentionally use one shortcut over another for a given outcome. As illustrated above, whenever the Sybase 32 bit package was upgraded or patched we would end up breaking our APPVVE shortcut across the developers machines. 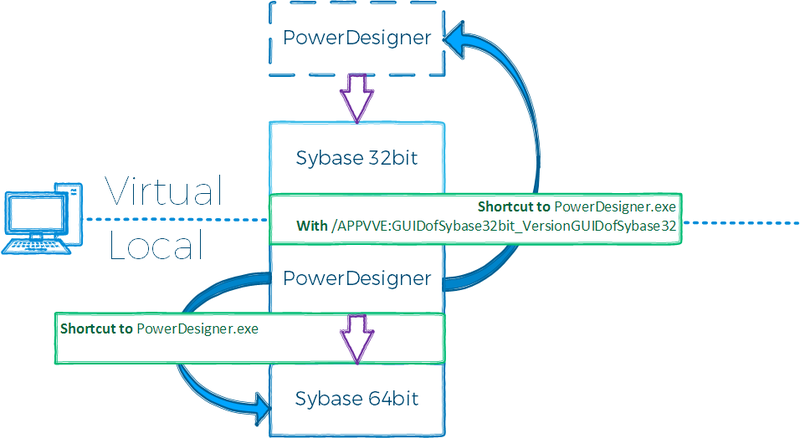 This is because the APPVVE argument uses both package GUID and version GUID to understand which virtual environment to launch within, upgrades to Sybase of course would change the version GUID and subsequently the APPVVE shortcut would fail to resolve and would launch PowerDesigner.exe outside of the bubble. The inability to use a wildcard for version in the APPVVE switch meant we needed to find another solution to make it less sensitive to version changes. The concerns around general implementation of APPVVE and handling of updates to packages led us to find an overall more manageable solution for delivery. 1. Delivering a stub package which delivered the shortcut to PowerDesigner to the local machine. We achieved this by sequencing a dummy package with a folder and file in the VFS, in the package editor we then added a shortcut which pointed to the local PowerDesigner.exe in C:\Program Files. Interestingly when this package is delivered to the machine, the App-V client knows to add the APPVVE parameter to the shortcut as long as it finds PowerDesigner.exe locally as expected. It automatically adds on the APPVVE switch to reference the package so there is no need to know this upfront. 2. Delivering a connection group that included both the stub package and the Sybase 32 bit package. We made sure the connection group was set to ‘use any version’ for the Sybase package so it would not be sensitive to updates. The combination of the above meant that when a user needed the ability to launch PowerDesigner with Sybase 32 bit they would call the help desk and request both the Sybase 32 bit package and the relevant stub connector package. The stub package would deliver them a shortcut with the APPVVE switch, which refers to the stub itself. As the stub would be in a connection group with Sybase 32 bit, PowerDesigner would see the virtual environment over the local install of Sybase. Whenever Sybase 32 bit is updated, the APPVVE shortcut would continue to work as it only ever refers to the stub package. Although the approach above might appear quite complicated it worked really well for my client who arrived at a solution that not only made the delivery of APPVVE ‘connectors’ easier to manage but also removed the sensitivity of updating the dependant packages. For the software deployment team it also made a lot on sense as when the relevant request came in they could deliver the equivalent connector stub package to achieve the desired behaviour. I recently had a the chance to sit down for a few days with a financial firm in London with the aim of driving down publishing times in their stateless non-persistent VDI environment. Over the engagement we implemented a range of techniques to drive down publishing times and consequently drive up the quality of user experience using the environment. 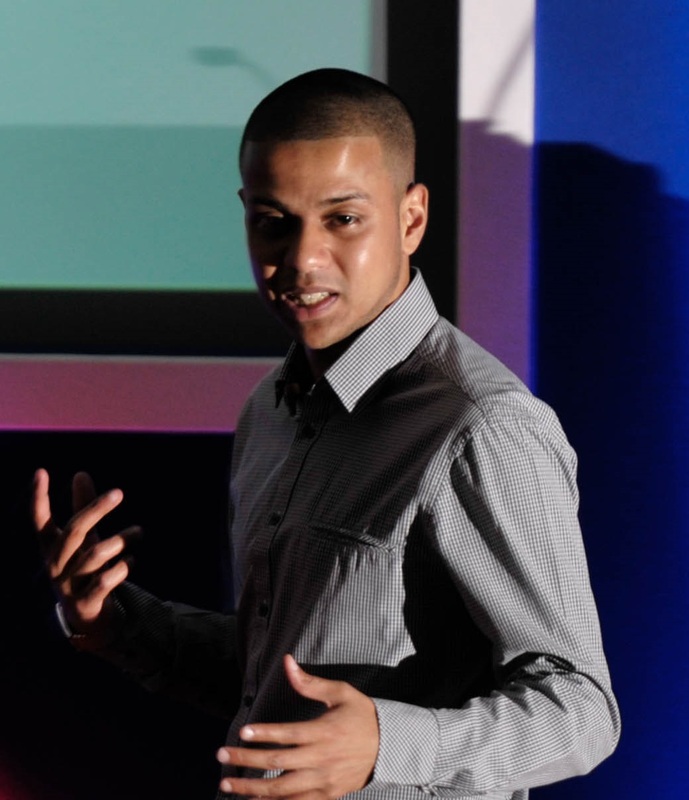 Many of these techniques are well established and known however putting them into practice in real world scenarios can be a different proposition all together. In this blog I share with you my rough recipe for success and like all recipes, you can always look to tweak it accordingly. Also just to mention everything below is my opinion based on my own experiences so if you see things differently feel free to use the comments section to voice your views! Before throwing App-V in the mix with any environment you need first understand your goals. Anybody who understands the value propositions of App-V will understand that it is highly desirable in stateless environments, especially when compared to traditional alternatives for software delivery. 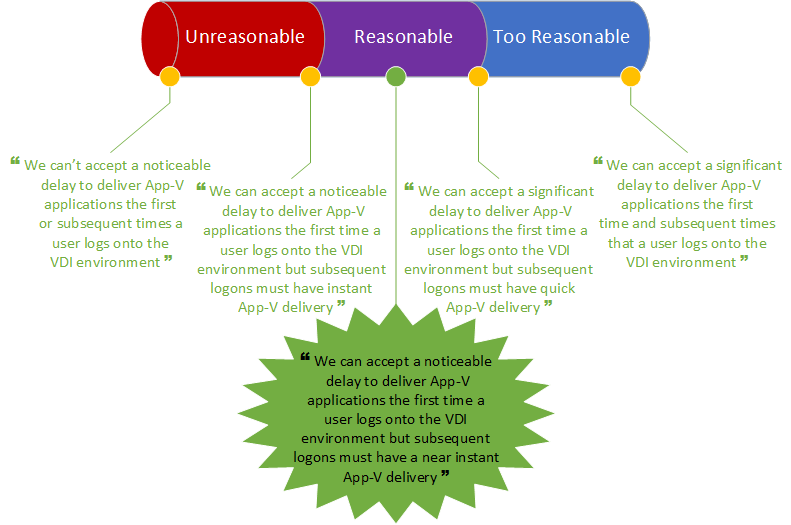 One of the main benefits is the speed to deliver an App-V package, this speed can vary depending on many factors but more importantly before any of this comes into play we must understand what acceptable speed in an environment actually is. Across all the different environments I have seen, from huge enterprises to smaller organisations, I have seen such a massive variance of opinion on what is an acceptable user experience. In most cases user experience needs to equal user expectations. The issue with this is in most cases is users moving from a traditional desktop to a VDI environment will already have their expectations that the new environment will be as good, if not better than what they have already. In the end of the day users don’t care how easy your new shiny VDI infrastructure is to administer, the touted cost benefits or anything else. Most end users will measure its success based on speed and usability. This is probably the biggest point of leverage when negotiating expectations concerning App-V package delivery times. The fact is many organisations will be happy to compromise on the first time a user logons onto the VDI environment aslong as you can ensure all future logons are less painful. In my opinion this approach is justified. Imagine even in non VDI scenarios where a user might be given a new machine, all their applications are unlikely to instantly be there until they logon and receive them. In my experience expectations can range from unreasonable to too reasonable and everything in-between with the highlighted green being the ‘sweet spot’. Please note the above assumes that first logon is when the new packages are delivered and subsequent logon carries little to no new package delivery. Also I appreciate words like ‘noticeable’ and ‘significant’ are pretty subjective timings and down to individual perception, but hey, that’s the nature of technology. Before you begin it is very important to understand what are your measurements for timing a package delivery. From an App-V perspective these can be separated into three main tasks, add, publish and mount. I can also highly recommend my friend Ryan Bijkerk’s tool called GAP-IT which will give you a graphical way to visualise how long packages are taking to publish. This task is encapsulated by the Add-AppVClientPackage command. During this phase package assets will be requested and populated into the Package Store (cache). However only feature block 0 will be fully fat on disk at this point with the remaining files being held in a sparse format until a mount takes place (naturally at launch or explicitly). The registry hive for the package will also get staged and a range of other registry keys such as CoW mappings and streaming properties will get written. This task is executed with the Publish-AppVClientPackage command. During this phase the package will get integrated for either user or machine by creating the relevant hardlinks to the Package Store. User based extension points such as shortcuts and FTAs will also be delivered at this point along with the generation of the catalog. This operation naturally occurs when a user launches a package that has not yet been committed into the Package Store, the extent to which this happens will be dependant on caching decisions made. When a mount occurs the App-V streaming driver will populate the Package Store assets for the package so they are no longer sparse and held locally. A mount operation can also be triggered manually using the Mount-AppVClientPackage commands. 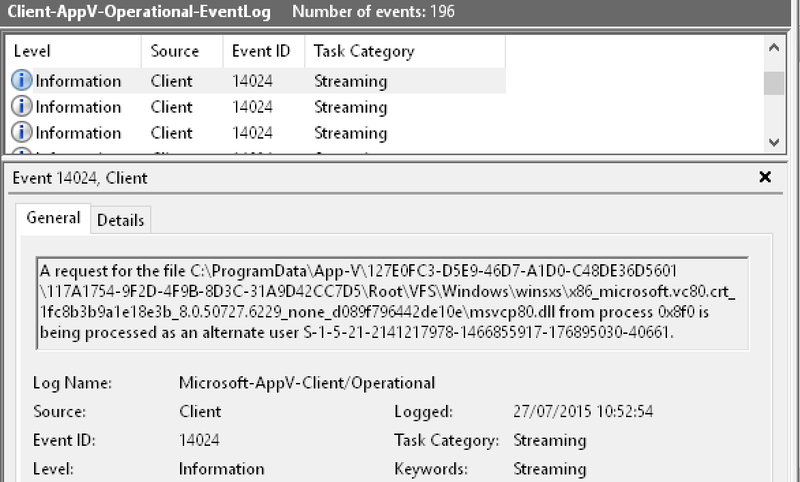 For further information about where and when the App-V Client puts stuff on your machine read this post here. Pre-adding packages into your image, can have a really positive impact on the time it will take your users to receive their packages after logon. Typically the add operation tends to take longer than a publish for a package so by doing this upfront you can save a lot of time to get your app delivered after logon. Please note in some occasions, if your package has lots of integrations then the publish will take just as long if not longer than the add, however even in these cases a pre-add is desirable. Pre-add is normally achieved by scripting. You can use something similar to below to list out your available packages from the management server and pre-add them onto the client. This is a generally well understood technique, by pre-publishing globally into the build you are essentially pushing the overhead out of the post login process. The pre-add, publish and mount can be done at composition of the image and new packages can be rolled into the master image periodically. Common techniques to add, publish and mount is to either script the operations or create a staging user which can logon and trigger a publishing refresh into the build which will trigger the add and publish followed by a manually scripted mount. The positive side to this approach is that any packages that have undergone a pre-publish globally will be ready and waiting for your users as soon as they logon to the VDI platform. By also mounting the package you can also ensure packages run straight from the package cache with no streaming taking place, of course unless you are using share content store mode. For the reasons above you may find that pre-publishing globally is only suitable for your core line of business apps or apps that are common amongst all users. So for applications you cannot publish globally you will have to take a pre-add approach. For the publish itself, one option to speed it up on user login is to remove any VC runtime captured by the package. While this will not be a popular suggestion with everyone as some people really like this feature, there is no getting away from the impact it has on the time to publish packages. 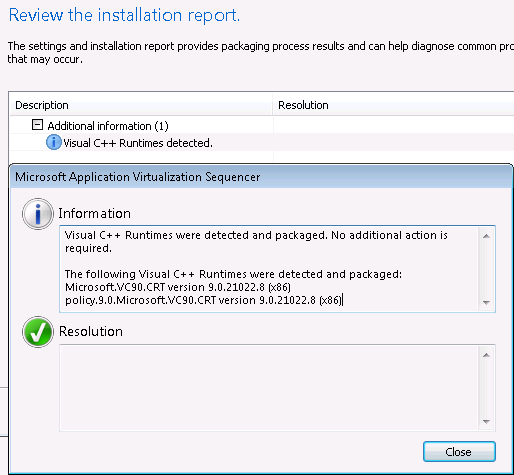 VC Runtimes being incorporated as part of your package will not only impact the add operation due to the increased size. They will most notably have a large impact on the time to publish, this is because it is at publish when the runtimes are copied down to the native system. The event logs will expose this delay. My fellow MVP Tim Mangan has written a great research paper on the effects on VS Runtimes which you view here. Another approach you might take to address time to publish is take a look at the integration’s your packages have. If you have packages that take particularly long to publish there might be scope to reduce some of the integration points. You can review these by browsing the AppxManifest.xml and checking to see if your package has unnecessary integrations such at FTAs, AppPaths, Fonts etc. By reducing these you will reduce the amount of work needed to publish and integrate your package to a given user and hence speed up the delivery. This being said there are some packages which are inherently complex and won’t have much room for trimming down so only get rid of integrations you are confident to remove. When you have done your best to reduce the impact on the initial publish of a package, your attention can move to subsequent logons. Out the box, assuming a stateless environment, every subsequent logon your user will need to have all the packages published to themselves again from scratch. By choosing to roam publishing state for the user we can capture much of the information that is laid down and make this available at next logon, this will speed up the time for the publish operation of the same packages there forward. If you choose to use UE-V to roam state in your environment then Microsoft have provided a template which you can use here. By roaming these locations you will capture key publishing information such as the user catalog and package integrations. By having these present at logon, your publish operation for the given packages will be significantly quicker. UE-V works by capturing changes a process makes, Microsoft aided this by wrapping the publishing refresh operation in SyncAppvPublishingServer.exe, this allows for only App-V related integrations to be captured. If you are using are not using UE-V and your UM solution doesn’t support only capturing changes from a given process then be aware that you might be roaming non App-V related integrations too, for example normal MSI delivered start menu items. By default the App-V client seeks to de-integrate and essentially clean-up packages that appear orphaned or deprecated. This is normally a good thing but if you chose to roam your user publish state the client will wipe away anything your UPM solution puts down before it initiates the publishing refresh. To stop this happening you will need to create a DWORD called PreserveUserIntegrationsOnLogin with a value of 1 in HKEY_LOCAL_MACHINE\SOFTWARE\Microsoft\AppV\Client\Integration. You can also set this during installation or using Group Policy. Once set it will give active feedback to your users as packages are being published after logon as a notification above the system tray. It is one thing making users wait, it is another making them wait with no indication that anything is happening. My advice is to enable this feature and improve the general user experience of your platform when receiving App-V packages. There are numerous choices you may make regarding streaming optimisation of your packages. For example the use of shared content store mode (SCS) is very popular in VDI as it seeks to reduce storage used on the VM. If you are not familiar with this concept and the other options available to you please check out my blog post called Streaming Decisions Points. In any respect my advice would always be to pre-ad where possible. If you chose to use SCS then avoid mounting your packages as this will override the setting. This testing was done for 11 packages per user and averaged across 3 logins per reading. As you can see the initial user experience meant waiting for over a minute before all of the packages published to the user were available for use and subsequent logons were pretty similar. Pre-adding, configuring UPM and removing VC runtimes from the packages brought the time for deliver down as detailed above. Infact the 12 seconds we were able to achieve for subsequent logons was not even noticeable by the users as the Windows platform was taking around this amount of time to idle and become useable anyway. The delivery time for first logon stayed at around a minute but by enabling the publish UI we were able to feedback progress to the end users while this happened. Okay but what about SCCM? I completely understand that not everyone is using App-V Server to deliver to their infrastructure, infact on my travels I see much more ConfigMgr solutions than I do App-V Server, mainly due to its scalability and feature set as compared here. The reality is App-V with SCCM to non-persistent VDI isn’t currently a great story. 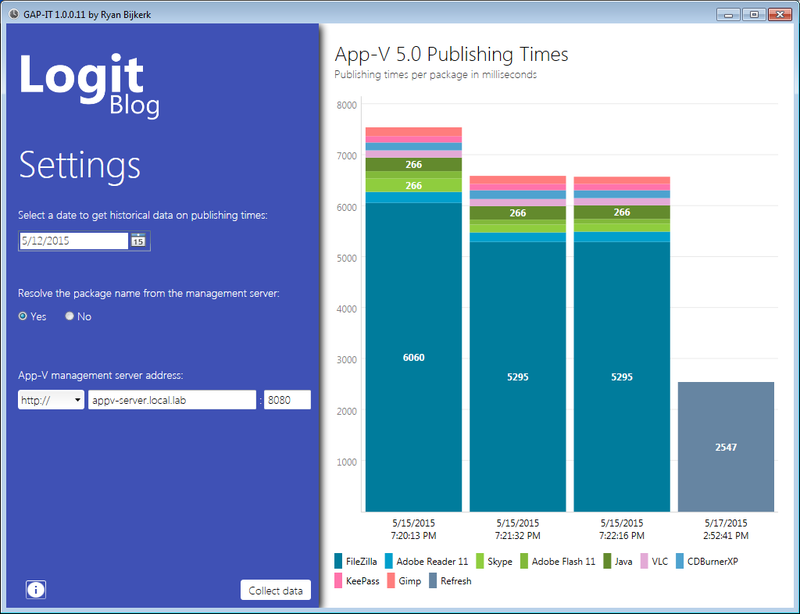 The SCCM client takes a longer period of time to kick in after logon to evaluate and publish packages to the platform. I have seen implementations that will take many minutes rather than seconds for users to receive their applications and while that is maybe bearable for first ever login to an environment it doesn’t tend to be acceptable for subsequent logins. During my time at Microsoft we heard this feedback a lot from customers and I always felt like it was on the radar for the team. Infact the ConfigMgr team did make performance improvements with the SP1 release of 2012 but to be frank it wasn’t enough. So who knows, maybe this will be addressed in the future. Until then you can still leverage some of the techniques above to speed up delivery such as pre-add, however roaming publishing state will not have any real effect as you will still be waiting on the ConfigMgr client to kick in after logon.